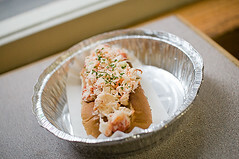 Got word last week that Urban Lobster Shack has opened a new location in the downstairs food court on 3rd Ave. btw. 49+50th (the one with Sophie’s Cuban and Pampano Taqueria.) Our original Downtown Lunch man Daniel Krieger wrote about their downtown location, where at one time $15 got you a lobster roll, soup, chips, cole slaw, crackers, and a water (although from the looks of their website the combo has gone up to $18.) $18 is way above the ML price range, but we’re talking about lobster rolls here. (The one at the very excellent Grand Central Oyster Bar takeout window is $27!) According to Lunch’er “Andrew”, they were doing a $10 special last week (lobster roll, caesar salad, and cole slaw) but not sure if that’s still going on. Early adopters, feel free to give us some info in the comments. Posted by Zach Brooks at 9:30 am, January 4th, 2010 under Seafood, Urban Lobster Shack.